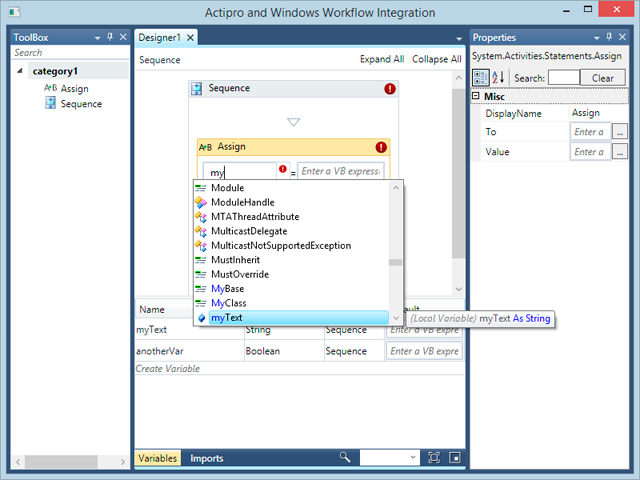 Back in August, we posted a blog entry showing off a sample we created, where a hosted Windows Workflow Designer instance is integrated with our WPF Docking/MDI and SyntaxEditor controls to dramatically improve the designer UI. We then posted a second update describing several more enhancements that were made. Updated to properly commit changes on editor focus loss. Updated the language to be a single instance instead of getting created for each editor instance, which improves performance. Updated to focus editor properly on the first mouse click. Added proper notifications of the expression editor's events. These and our prior updates dramatically improve the end user experience when working in a rehosted Windows Workflow Designer scenario. In our last post, we announced that incremental search result highlights werecoming to SyntaxEditor for WPF, WinRT/XAML, and Silverlight in the next maintenance release. These are highlights that show where each match of the incremental search text is within the document, making it easy for the end user to see the matches without having to iterate through each one. We also are making this feature available for those who have search panes in their apps and want to be able to highlight matching results as the user enters find text in the search pane. Each editor view now has a new property on it named HighlightedResultSearchOptions that can be set to any ISearchOptions value. When it is set, a worker thread searches the document for matches and highlights them. In the screenshot above, we type in a TextBox and in the TextBox.TextChanged event handler, update the value of the view's HighlightedResultSearchOptions property. Highlights then appear for the find text matches, which is "doc" in this case. The search result highlights help the end user quickly see where matches are without the need to cycle through them, and can be wired up to any search pane. This feature is coming in the next maintenance release. 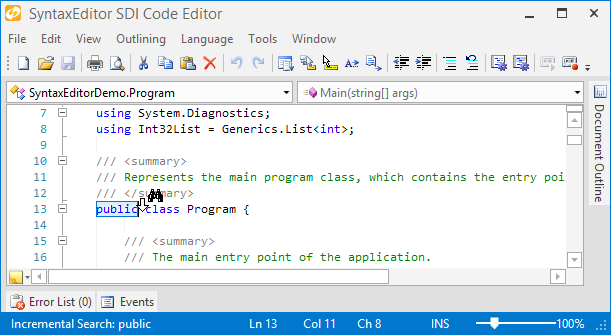 In our last post, we announced that incremental search features were coming to SyntaxEditor for WPF, WinRT/XAML, and Silverlight in the next maintenance release. We are working on an ancillary feature to that, which we hope to also have completed soon. This feature automatically highlights matching results when doing an incremental search. To start incremental search mode, press Ctrl+I and start typing some characters. The characters will be accumulated into a find text string and used to search the document for the next instance of the find text, which will be selected. For this sample, I have pressed Ctrl+I and then "r". All of the instances of the letter r in the editor have been highlighted. Now I will continue to type out the full word "random". 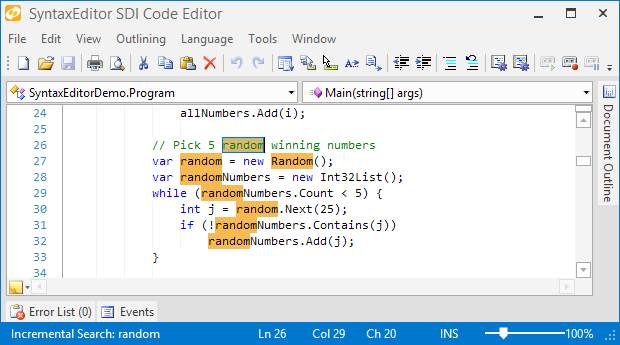 All of the instances of the word random are now highlighted. The first instance is selected. Pressing Ctrl+I at this point would move the selection to the next highlighted instance.. The search result highlights help the end user quickly see where matches are without the need to cycle through them. We hope to have this feature in the next maintenance release. Another new feature is coming to SyntaxEditor for WPF, WinRT/XAML, and Silverlight in the next maintenance release: incremental search. To start incremental search mode, press Ctrl+I and start typing some characters. The characters will be accumulated into a find text string and used to search the document for the next instance of the find text, which will be selected. Press Ctrl+I to move to the next match, or Ctrl+Shift+I to move to the previous match. Continue typing characters to append to the find text. Backspace can be used to remove characters from the find text. Esc can be used to deactivate incremental search mode. 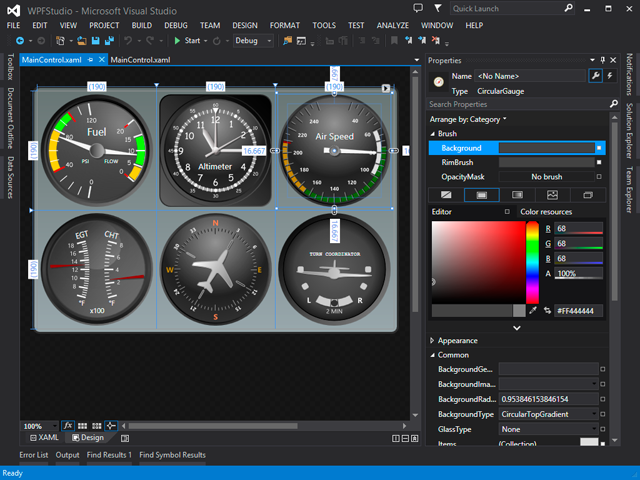 The WPF and WinRT versions are capable of showing custom cursors while incremental search is active, enabling the end user to have a visual indicator of the current mode. 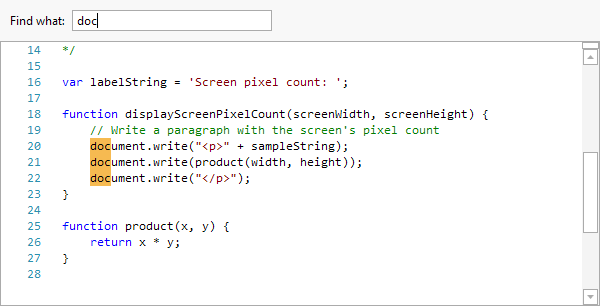 Silverlight unfortunately doesn't allow for custom mouse cursors. It is recommended that all platforms also show some sort of status bar indicator. In the screenshot above, you can see how the StatusBar is updated as I type to show the current find text. Incremental search is already available in SyntaxEditor for WinForms and will now be in the other SyntaxEditor platforms after the next maintenance releases. We just wanted to post a quick reminder that all of our latest versions of WPF, WinRT/XAML, Silverlight, and WinForms controls support the new Visual Studio 2013 version. 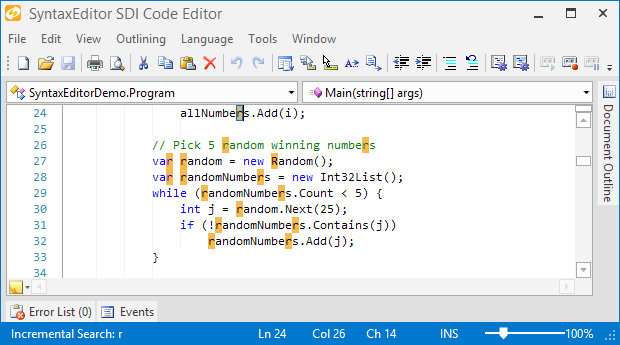 If you haven't tried VS 2013 yet, we urge you to download it from Microsoft's site. It features a more refined design than VS 2012, and is a pleasure to use. In particular, we love using the new Team Explorer tool window and peek definition editor feature. Also, in case you haven't heard, Microsoft is hosting a Visual Studio 2013 Virtual Launch event on November 13. The event will consist of a keynote speech and they will be going over the new features in subsequent technical sessions. Be sure to check it out.